Heat 1 tablespoon of oil in a skillet over medium heat. Add the chicken to the skillet seasoning with salt, pepper, and five spice powder. Brown both sides. Remove from pan. Add the remaining oil to the skillet. Add onions, peppers and chili to the skillet and sauté till tender. Add the juice and use it to deglaze the pan. Reduce sauce; return the chicken and any juice to the pan. Cover and cook on simmer till chicken is cooked through. Remove the chicken to a cutting board to rest. Add orange zest and cilantro to the skillet. 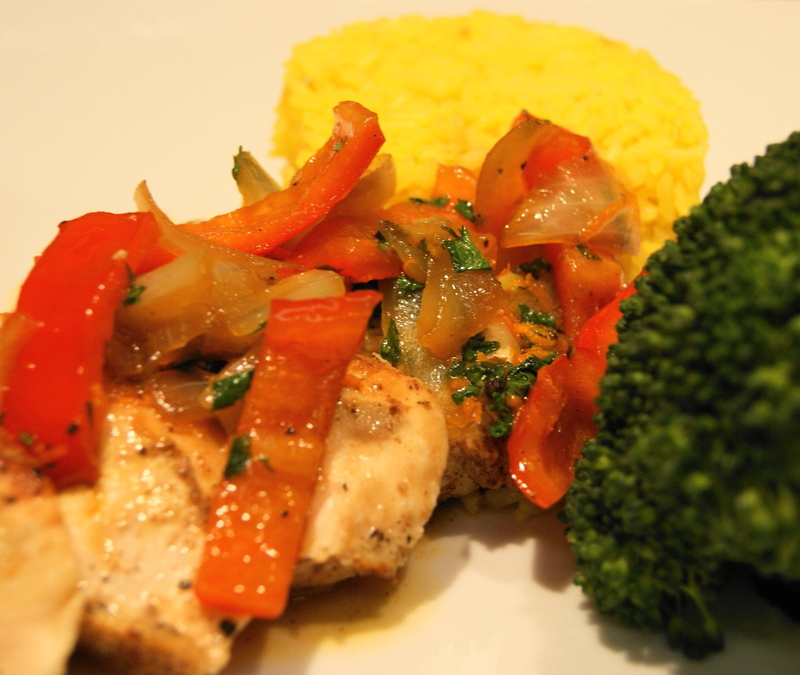 Slice the chicken and serve with the orange sauce and vegetables over the sliced chicken. Bring chicken broth to a boil; add butter, turmeric and rice. Bring back to a boil. Lower heat to a low simmer and cook till rice is tender.